GUTI/ROUSTAM Re:Introduction EP vinyl at Juno Records. 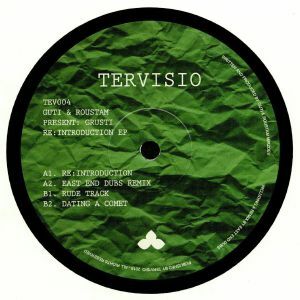 Argentina's Guti and Russia's Roustam go head to head on this new house-techno hybrid EP for the fast-evolving Trevisio imprint. The fourth EP in the series sees the two artists collaborate in the studio, and the results are unfailingly seductive - itchy house vibes all around! The opening "Re:Introduction" sets the scene with a deep, dub-fuelled house gem that lacks absolutely no energy in its charging percussion, and that's followed by an even more hypnotic blend of bass and beats thanks to the East Man Dubs remix. "Rude Track" strips the bass back in favour of more synths and heavier kicks, while "Dating A Comet" is the duo's most accomplished tune, meandering its bleepy waves to a sway of subtle delay and dubbwise flavours.